With Magic 2012 spoilers being previewed left and right, this post has changed quite significantly since March 16th. If this is your first time coming to this page, you'll notice the earlier parts of this post are outdated since I kept adding edits to the bottom of the post with new content. Since other sites already have almost the entire visual spoiler up, there's no need to update this post anymore. If you are new to this site, please feel free to look around and I hope you enjoy your stay. This particular article is a bit on the dry side since it's mostly an info dump so I would definitely recommend checking out other articles around the site which should be much more interesting. 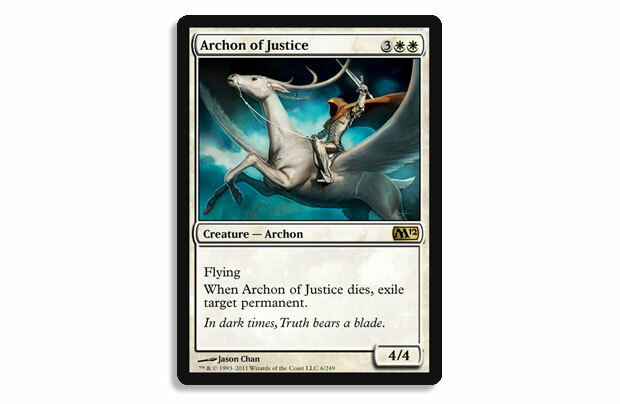 Have you been hankering for Magic 2012 spoilers? Here's your fix if you aren't up to date on the whole story. Last weekend, the image above was posted on the official Arcana and it was stated that this picture applied to both the new Duels of the Planeswalkers 2012 game as well as the set Magic 2012. Source here. It's blatantly obvious that Ajani and Liliana are no longer hanging out with the popular crowd as Gideon and Sorin have replaced them. The big question now is: "Which versions of these Planeswalkers are we going to see?" This is a very relevant question as this could just as easily be Jace Beleren and Chandra Nalaar or Jace the Mindsculptor and Chandra Ablaze. Only time will tell. It's important to take a look at this setup of the new core five Planeswalkers because of what this may or may not imply. 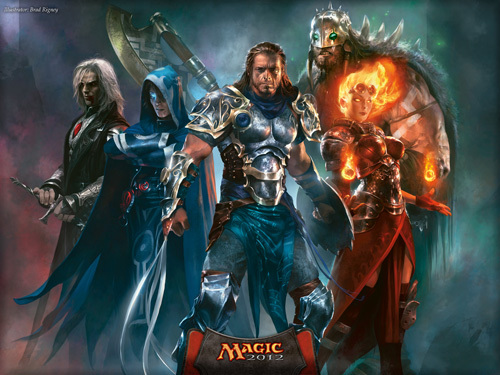 The tagline for Magic 2012 is "Gather your Allies" (Source here). Just recently at PAX East there was a quote stating, "I have made allies out of my enemies." - Gideon (Source here among other goodies from PAX East such as Commander Precon Previews). We last saw Gideon leaving for Ravnica to gather help against the Eldrazi threat on Zendikar, Jace and Chandra are part of the reason the Eldrazi are freed thanks to their involvement in a battle against Sarkhan, and Sorin is one of the three Planeswalkers to seal the Eldrazi away ages ago (and neither of his allies showed up as planned to check on the seal as Ugin has already been shown dead) as well as recently being witness to Nissa foiling his plan to fix the seal before leaving Zendikar as he had no better options at the time. What am I getting at with all of this info? All of these characters, except for our fuzzy friend Garruk, are involved with the Eldrazi and have reason to stop the threat before the Eldrazi devour anymore of the multiverse. Incorporating Garruk would be rather simple as there are numerous routes they could take with his character. This could very well be our dream team of "good guys" to deal with the Eldrazi threat. This could also imply that we'll be seeing the Zendikar versions of Jace and Chandra. As the new artwork for Chandra above was already shown in a previous link, here's the new Jace art (Source here). It's important to point out the similarities between this new image and the original Planeswalker art for Chandra and Jace. Chandra is in a very similar pose while Jace has almost identical Blue energy swirling around his hand. The art direction leans in the favor of the original Planeswalkers being reprinted for yet another Core Set. Remember the Planeswalker Signature Spells in Magic 2011? It looks like the concept will be making a return with all new spells (Source here). 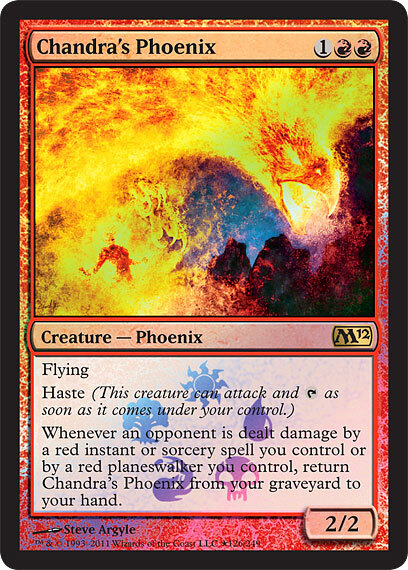 The image above is for a new spell titled "Chandra's Phoenix". I'm personally intrigued as I'm a fan of what they pulled off with the original signature spells. They made great support spells and build-around cards for several deck types without even needing their respective Planeswalker to excel. A few have been tournament worthy and the majority of the rest are casual favorites for all sorts of shenanigans. What's not to love? EDIT - May 23, 2011 - UPDATES! Mechanics were finally shown on the Mothership today. 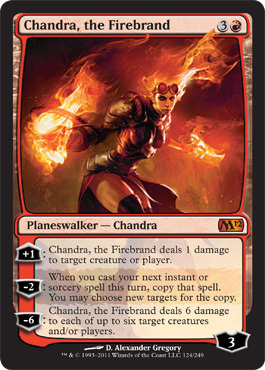 The most exciting card out of the bunch for me personally is Chandra's Phoenix (shown below). The art shown is the "Buy-A-Box Promo" artwork. The art displayed earlier in the post will still remain as the actual card art. This works alongside Chandra Nalaar, Chandra Ablaze, and even Chandra-less decks. Red mages should be happy all around. EDIT - June 17, 2011 - UPDATES! I'd like to apologize for the lack of updates on this post but I wanted to wait things out and see what direction this set was going before posting anything comprehensive. Also: everyone knows I'm not turning this into a visual spoiler so I'm only pointing out major concepts of 2011. - There are a hefty amount of auras already previewed in White and we still have over 100 cards left to be previewed. - Auramancer is a new card that brings back an enchantment from the graveyard. - There are at least four Griffins printed so far and a Griffin Rider that gets a bonus if there is a Griffin in play. There's no telling if this means Griffin tribal is the focus for this particular core set but it's something to consider. - So far there are already six creatures that have abilities based around combat tricks. - Hexproof will also be in Blue. This was to be expected but it's still important to note. - Illusions seem to be the focus for Blue tribal in M12. So far we have Phantasmal Bear (U for a 2/2) and Phantasmal Dragon (2UU for a 5/5 flyer). Both of which die if they're targeted by anything. - Lord of the Unreal is a human wizard who is also the "Illusion Lord". He gives all Illusions hexproof and +1/+1. 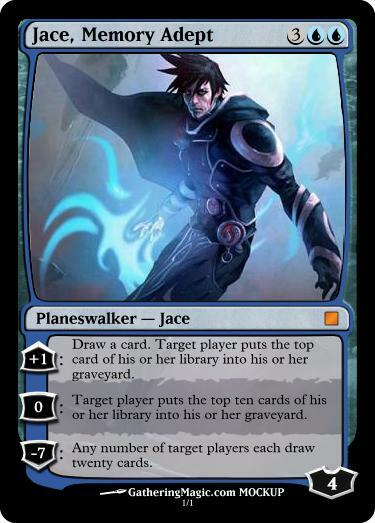 - Jace's Archivist is getting plenty of people excited already. 1UU for a 2/2 that can tap for U to force all players to discard their hand and draw cards equal to the greatest number discarded this way. A repeatable Windfall ability is nothing to sneeze at. - Vampires are the primary focus (was there ever a doubt?) and Bloodthirst seems to be their main ability. Flavor-wise this makes perfect sense. - Bloodlord of Vaasgorth is the vampire lord for this set (we seem to get a new one every set). 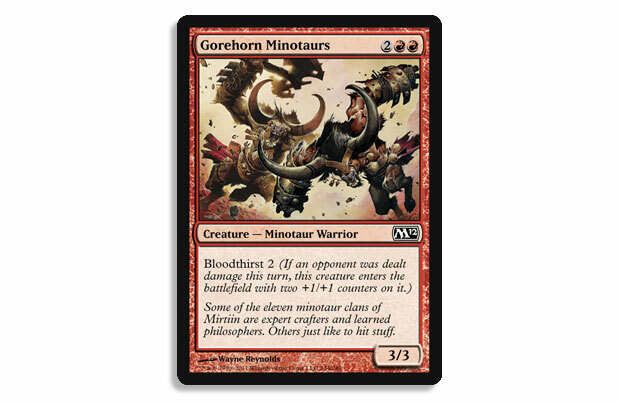 He's 3BB for a 3/3 flyer with Bloodthirst 3. He also gives all vampires Bloodthirst 3 when they're cast. - Devouring Swarm is rather notable since it's a flying Bloodthrone Vampire/Nantuko Husk variant. - Zombie Infestation will be reprinted. - There are already 3 Dragons previewed so far. This doesn't necessarily mean anything since M10 also had 3 while M11 only had 1. - Bloodthirst is also in red. This also makes sense flavor-wise. - Goblin Grenade will be reprinted. - Inferno Titan will also be reprinted. That doesn't automatically mean the Titan cycle will be reprinted but it's highly likely. - Hexproof is primarily in Green. We already knew this but there are already 3 creatures shown with Hexproof. - Hunter's Insight is rather notable as it's another decent card draw spell for Green. 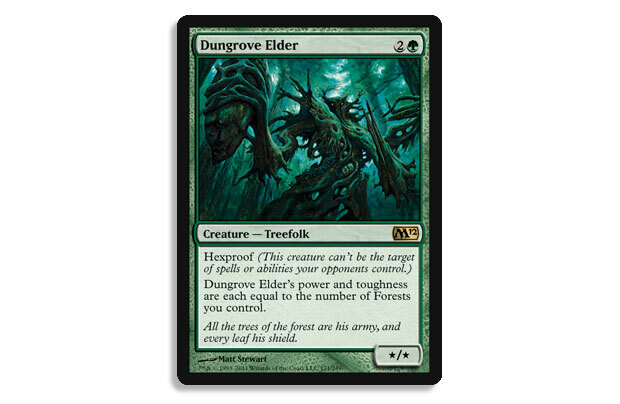 - Elvish Archdruid will be reprinted so Elves are going to remain the tribal focus of Green for M12 (I won't lie, I was hoping they would mix it up for a change). - Garruk's Horde is the new signature spell for Garruk. 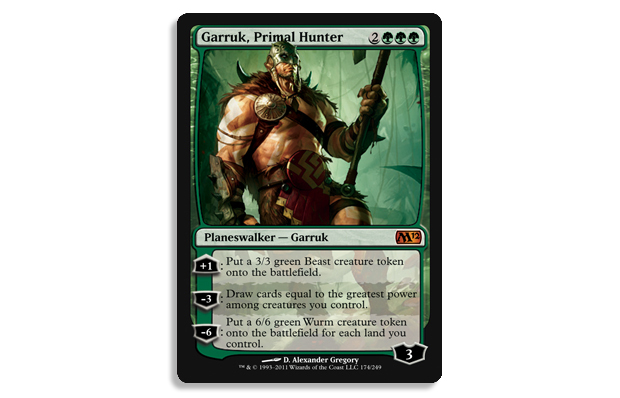 Garruk's Companion has also been shown to be reprinted. The thing to note is that neither of these have any synergy with Garruk Wildspeaker. Does that mean we'll be getting an all new Garruk? There's no telling just yet. G4TV's Attack of the Show actually previewed this today. All of the speculation and rumors have turned out to be true (except for all of the fake versions people have come up with of course). This is Kylak signing out and wondering if Gideon will become the new poster child for awhile.